High Quality Content by WIKIPEDIA articles! The Dodge Nitro is a compact SUV from the Dodge division of Chrysler. Launched for the 2007 model year at the Chicago Auto Show, the Nitro shares its platform with the second generation Jeep Liberty. It is assembled at the Toledo North Assembly Plant in Toledo, Ohio. The Jeep facility is part of an automobile complex which includes the Toledo South Assembly Plant, home to the Jeep Wrangler since the 1940s. On November 4th, 2009, Chrysler announced the model will continue until 2011 when it may see a second generation, or be discontinued. Introduced for the 2007 model year, the Nitro became Dodge's first compact SUV since the Raider was discontinued in 1990. 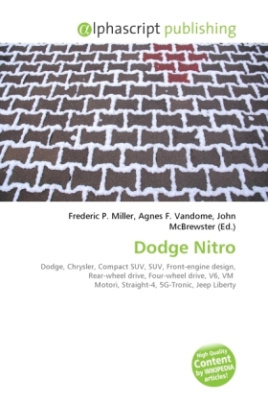 It also became the first modern Dodge branded automobile to be sold in Europe since its introduction in early 2007. In the U.S., the Nitro went into production in August 2006 and went on sale in September of the same year as a 2007 model. All Nitros are available with rear-wheel drive, and part- time four-wheel drive is available as an option.